One of a kind map of a Civil War Camp in Arlington Heights, Virginia. Encampment of the 25th Regiment Maine Volunteers. This is an unusual Civil War broadside map illustrating the Encampment of the 25th Regiment Maine Volunteers. The map illustrates the Arlington Heights Camp of the 25th Maine Regiment where they spent the Winters of 1862 and 1863. The 25th Maine Regiment was generally stationed in the vicinity of Washington D.C. where they were assigned garrison duty in the defense of the capital. 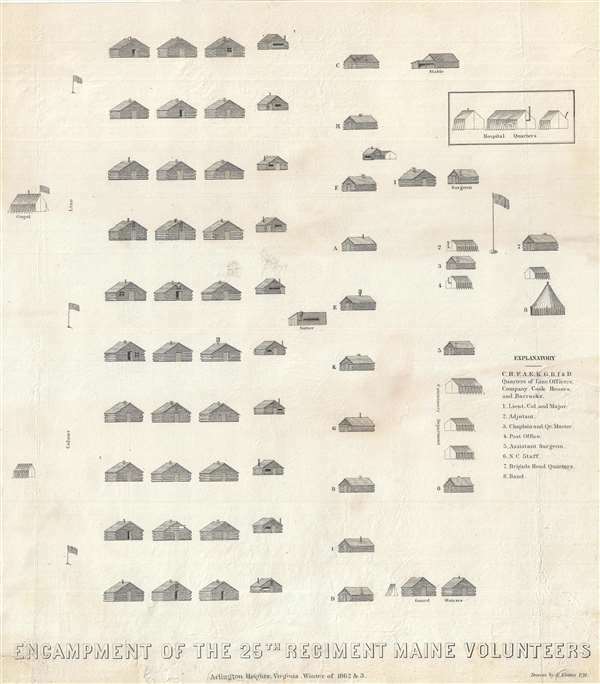 The encampment map illustrates a well-developed near permanent camp, with solidly constructed log cabins for the troops, as well as a post office, Hospital Quarters, commissary department, and more. The camp map was compiled and printed by E. Evans, P.M. It is unclear who Evans was, but there was an Eleazer Evans attached to the 25th Maine Regiment. The P.M. following his name likely refers to Post Master and although we can find no verifying records, it is not unlikely that Evans was postmaster of the regiment. An individual by the same name went on to work in the postal service in Lancaster Pennsylvania following the war, but it is unclear if these are the same or related individuals. This broadside appears to be quite rare with no other examples known in any collection, public or private. It may have been issued for internal camp use during by the postal service during the war. Good. Light discoloration. Even toning. Some repairs lower margin. Backed on archival tissue.